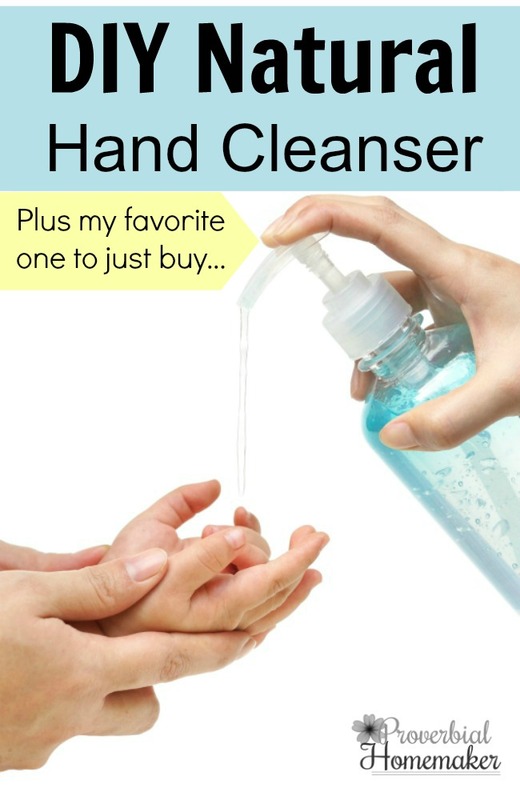 I’ve been making DIY natural hand cleanser for a few years now as replacement for commercial hand sanitizers. There are times when I just use whatever we happen to have, especially after a trip to the grocery store or a kid play place just crawling with germs. But I’ve been slowly working our family over to more natural hand cleaning solutions when washing with soap and water just aren’t an option. 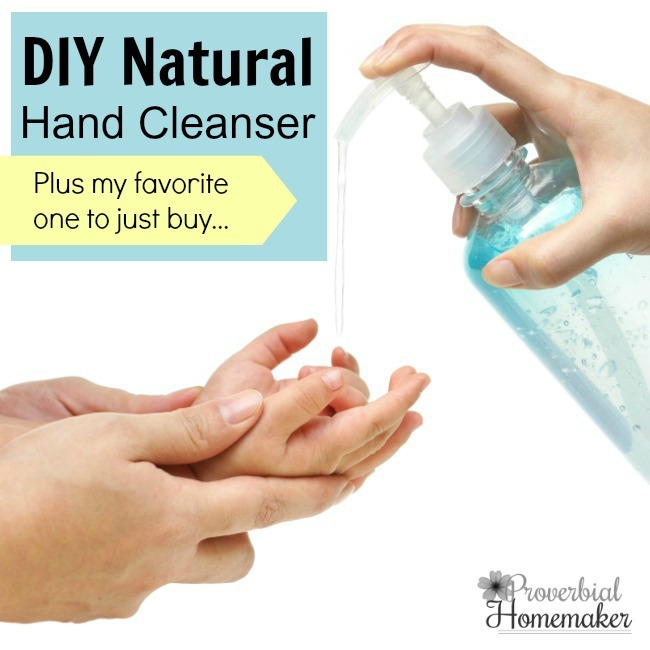 There are a few criteria I have for DIY natural hand cleansers. First, I need them to not be so incredibly drying. Hand sanitizers can be so brutal that way! Second, I need them to WORK! Since I am using them as a backup to good old soap and water, I am ok with ditching the alcohols in favor of less drying solutions. But it still needs to do a pretty good job! And finally, I need it to be pretty easy to make and very easy to use. I’m not going to make a complicated recipe every two months and then open a jelly jar to apply it. Who has time for that? Given all that, I’ve tweaked and modified my favorite recipes over the past few years to come up with two favorites I know you’re going to love! PLUS I have a just-let-me-buy-it solution for us busy mamas who aren’t ready or interested in making our own. This recipe has been tweaked a bit over time and I’ve finally landed on the oils for their therapeutic properties as well as the lovely scent. You can do the uber simple version and stick to the first two oils or make it really a powerful solution with all four main oils. Get a good quality aloe vera gel without too many additives. Many times it will contain natural preservatives like potassium sorbate, citric acid, vitamin E, and xanthan gum, but anything beyond that is suspect and can influence your recipe. Lavender and orange smell amazing and and both have wonderful antibacterial properties, as do Ravintsara and Spearmint. 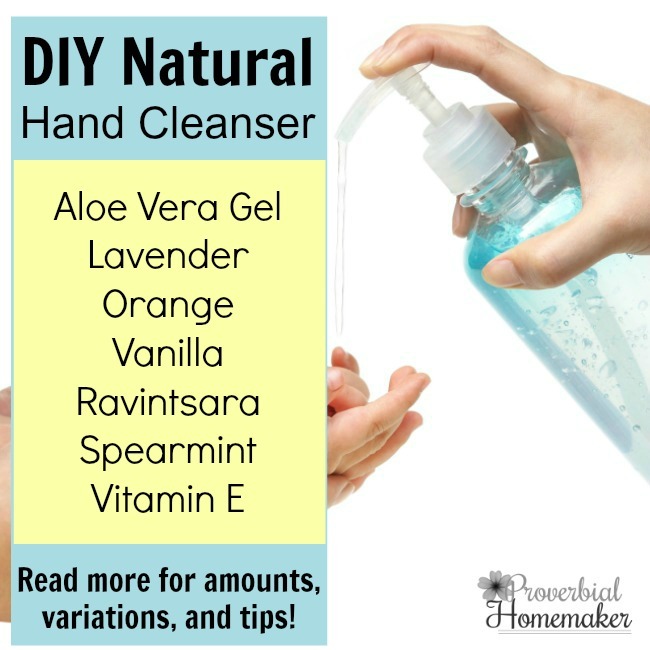 Lavender and Orange are pretty common for DIY natural hand cleanser recipes for obvious reasons, and I started trying Ravintsara and Spearmint when they were recommended for a cleanser during my aromatherapy certification course. I am so pleased with the results! You can follow the links to find out how all these oils contribute to the success of the blend. The Blend of Vanilla is completely optional and just because it smells so good! This blend will last about 2 months, more if kept refrigerated. If I happen to have some vitamin E capsules on hand, I’ll break one into the blend and mix well. This helps add a moisturizing effect since aloe can still be a bit astringent. Plus I hear it helps extend the shelf life of the blend. There are times when I’m just too busy and know that even a simple DIY recipe will not make it into my schedule. I love Grove Collaborative for the few natural products that I MUST buy (dishwasher detergent, Castile soaps, etc.) plus these extra bonus products that make my life so much easier while allowing me to avoid the chemicals of store-bought products. Check out Grove Collaborative here and look up their Dr. Bronner’s hand sanitizer! How about you? What do you use for natural hand cleansers? I normally make this one but don’t usually have the optional aloe &/or vitamin E.
Love Dr. Bronner’s products! And this DIY hand santizer looks is perfect to avoid all the extra chemicals. I have tried the Dr Bronners lavender. The lavender smell is just super strong to me so I don’t use it much. I wonder if you could dilute it and get good results? In your hand sanitizer recipe you use aloe gel. Is this thick, runny, drinking or topical aloe please. Hi! Here’s a mini post I wrote up and haven’t published yet. Hope it helps! Some people don’t like the scent of lavender or even seem to have an averse reaction to it. If that’s you, try one of these substitutes! Sweet Basil (Ocimum basilicum ct. linalool): This is a warming oil that is great for cleaning the head (perfect for allergy symptoms), relieving muscle spasms and pain, healthy digestion, and reducing nausea.